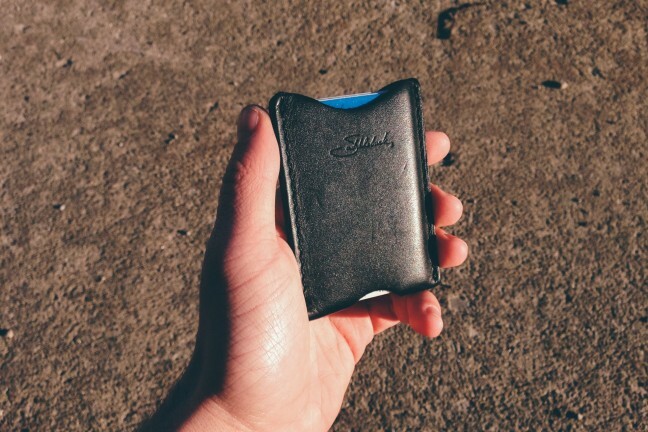 This little pouch offers some incredible value, and even if you don’t take advantage of the myriad of ways it can be worn and carried, it will likely still have features that can replace some gear pouch or dopp kit you already own. 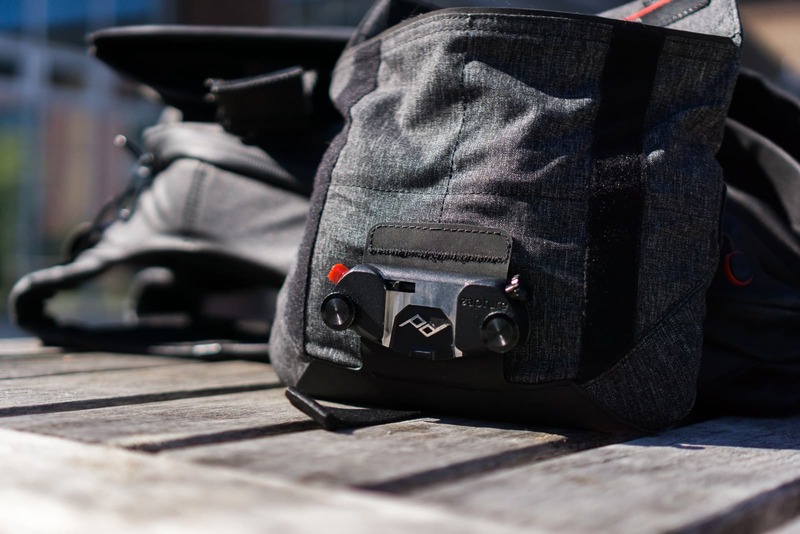 When Peak Design announced their Everyday Messenger last year, I was basically glued to YouTube and Kickstarter. 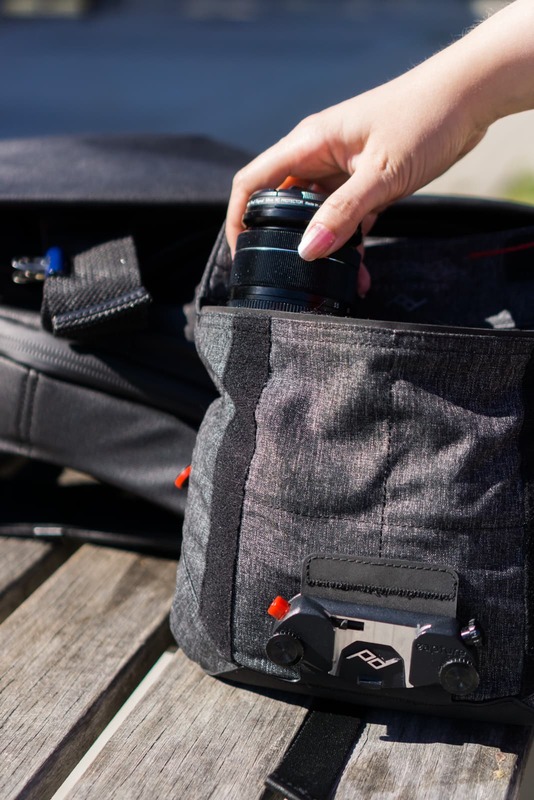 The Peak Design Field Pouch makes for a fantastic camera accessory bag. At some point during the campaign, Peak Design also mentioned they were making something called the Field Pouch: a water-resistant gear pouch that could grow in size to fit little knick-knacks and even extra lenses. The Everyday Messenger was the more appealing product and I mostly skimmed the marketing material for the pouch. Originally, the pouch just didn’t seem nearly as exciting as the bag. Vertical strips of velcro let you increase the height and depth. However, one year later, it’s the Everyday Messenger I’ve actually passed on purchasing. 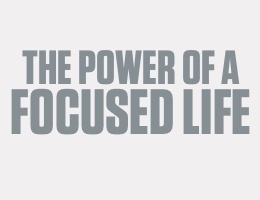 Instead, I own a Field Pouch, and I take it with me absolutely everywhere. Before the Field Pouch, I carried little cables and extras in a zippered canvas pouch. I’d even sewed a set of pockets together so all of the items would lie flat during storage instead of bunching into a corner during transit. However, the Field Pouch is a much better solution than a zippered pouch for everyday use. I love the quick, easy access provided by the pouch’s cavernous opening. 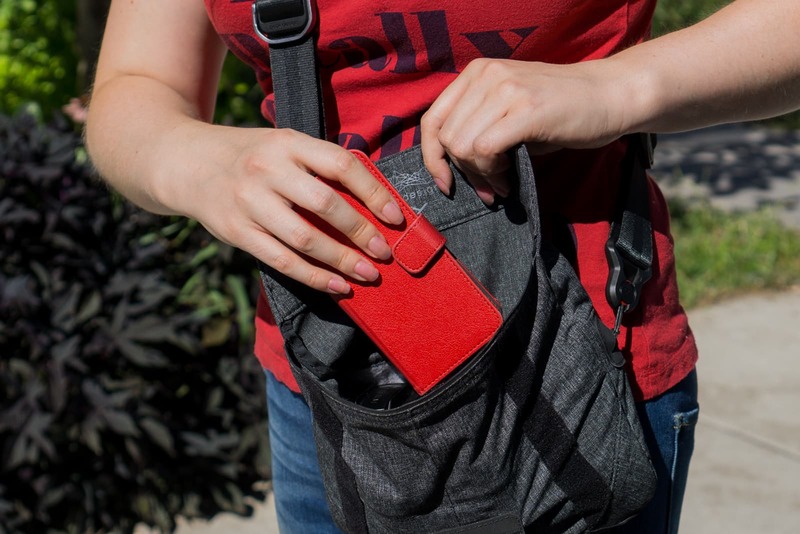 The Field Pouch has no zipper on the outside — the closing mechanism is actually two vertical strips of velcro. I normally dislike products with velcro because of the noise, but these strips are thin enough that I don’t mind them. Choosing velcro as a closing mechanism also enables one of the Field Pouch’s best features: expandability. 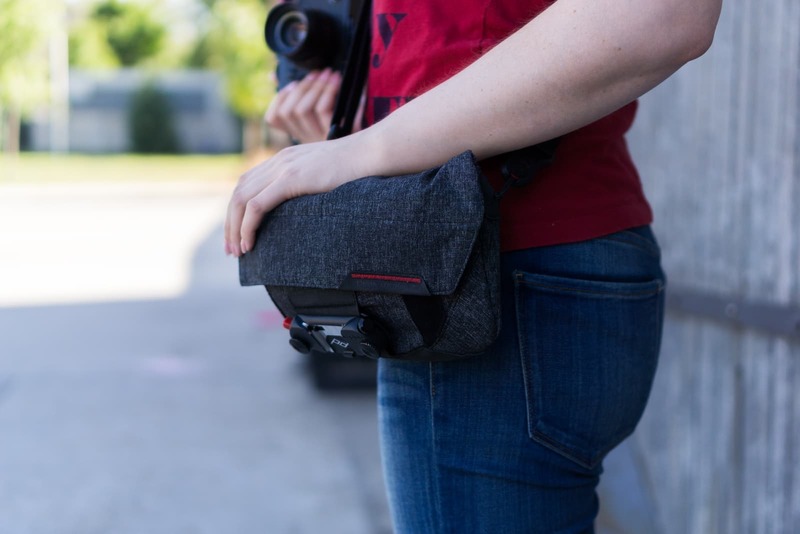 Based on where you choose to seal the velcro, the Field Pouch can either be very slim and small, or expand in height and depth to accommodate lenses and wallets. I can manage to fit two APS-C sized lenses into the Fuji. I can keep the XF23mm f/1.4 and XF18-55mm f/2.8-4 side by side. 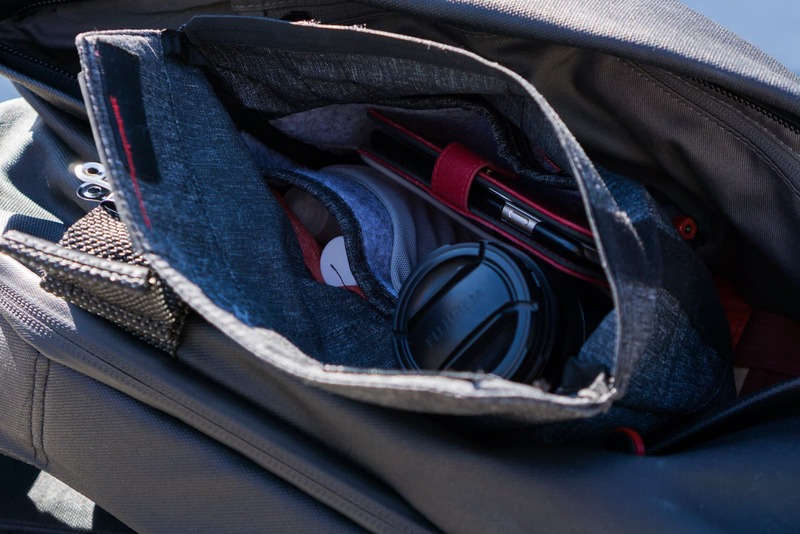 Ninety percent of the time, the Field Pouch can be found in my messenger bag or backpack. I like using pouches for storing smaller items because it makes it easier to switch bags. I take a few items and the pouch, throw them into another bag, and I’m all set. Now that I own a few Fuji lenses, I’m also finding the Field Pouch a fantastic case for storing two lenses during transit. I can easily fit the XF18-55mm f/2.8-4 and XF23mm f/1.4 in the Field Pouch alongside my regular carry. The pouch isn’t padded, but I like knowing that nothing in my bag will be scratching or coming into direct contact with the lenses. Do you remember fanny packs — the ultra stylish waist bags? 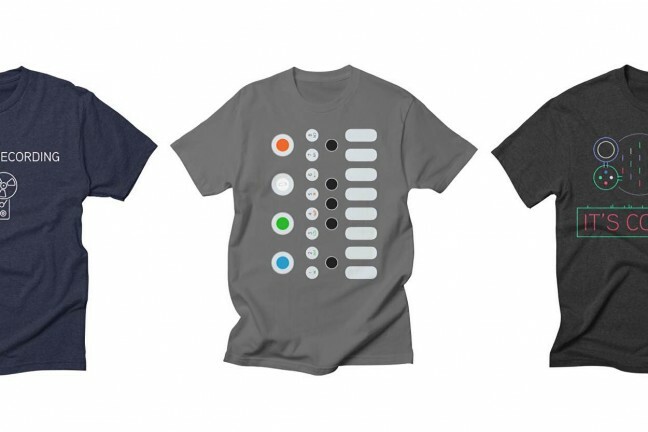 I, admittedly, wore one in high school that was stuffed with a MiniDisc player and my headphones, and I loved the convenience it provided. I’m far less willing to wear a little bag on my belt these days, but if the occasion called for it, I would choose the Field Pouch. 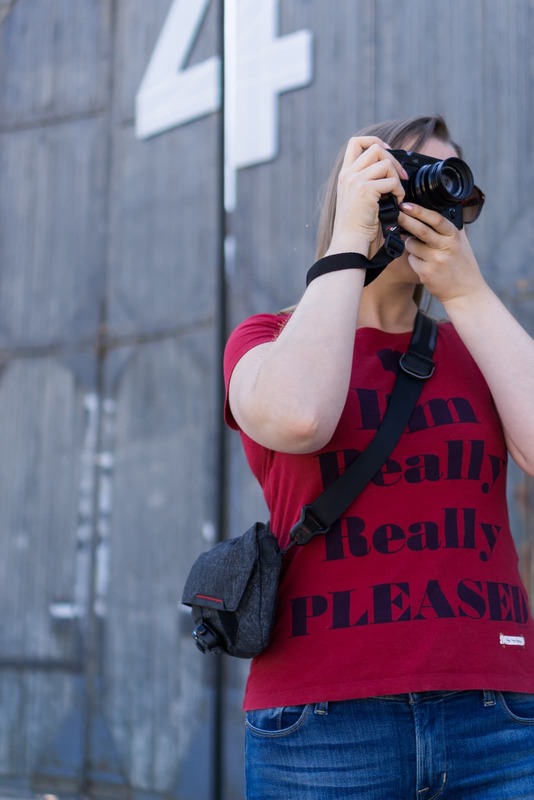 I usually have some sort of bag with me wherever I go, but on days where I just want a camera and a few accessories, the two belt straps along the rear of the Field Pouch work well and feel very secure. The only caveat is that, once you’ve loaded the pouch with even one lens, this becomes noticeably more weight for a belt to hold in place. I could feel my belt being pulled downward more than usual. Aside from that, this is a great way to store an extra lens and keep a low profile. Mounting the Field Pouch on my belt also makes lens swaps much easier. I can mount the X-Pro 2 on the Capture Clip, and then trade my current lens with an alternate stored in the pouch. It’s easy to just reach in when the Field Pouch is attached to a belt. Just above the two belt straps on the rear of the pouch are two anchor points. These can attach to any of Peak Design’s straps, like the Slide LITE. This feature could also have been very gimmicky, but it has turned out to be genuinely delightful in practice. The pouch is clearly meant to be used this way, and that’s why the exterior is water-resistant and tough. If you own a Capture Clip from Peak Design, you can mount a camera externally. That’s a total of six pockets in a little pouch that you can wear cross-body or on your belt. 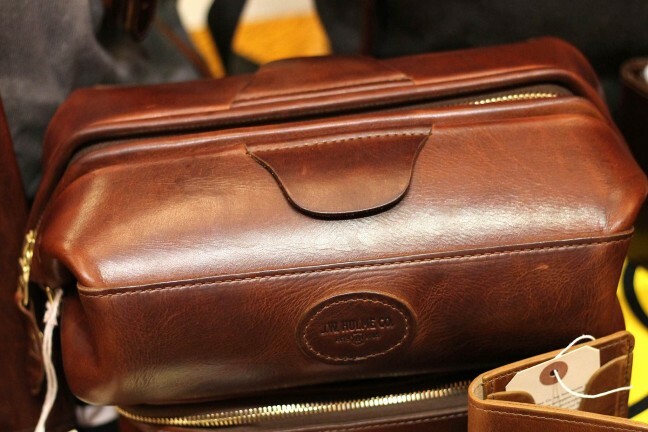 They’re all sized very well, and each of them remains useful, even if the other pockets already have items in them. You can tell the team at Peak Design really threw a lot into this pouch on a regular basis to make sure it could handle real world use. When you find a subject, swing the bag to your side and release the Capture clip to grab your camera. The pouch stays nicely out of the way as you shoot. It was a little nerve-wracking to mount my X-Pro 2 to the pouch at first, but it can easily handle the weight of my 23mm f/1.4 (my heaviest lens). I love the feeling of having the camera on a strap, ready to be drawn quickly from the Capture Pro. As long as the flap isn’t closed too far down, it’s easy to re-attach my X-Pro 2 to the Field Pouch without looking. 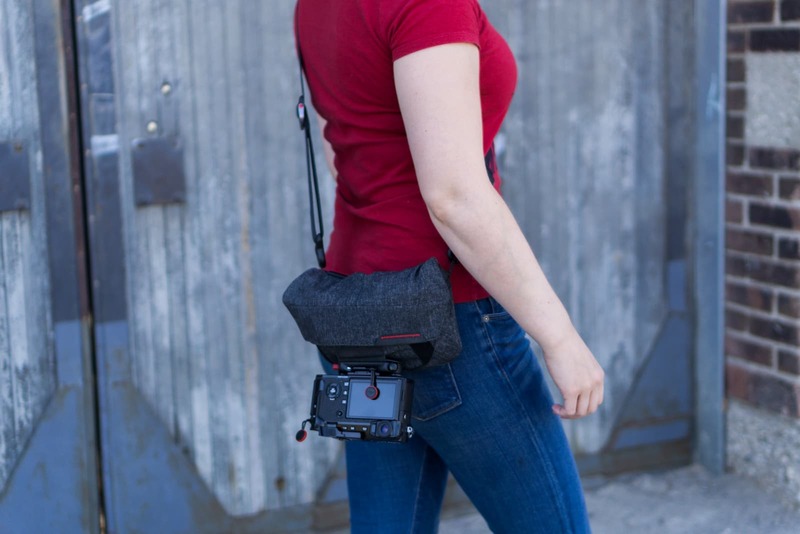 I tend to carry the camera externally because the Field Pouch isn’t able to hold my X-Pro 2 (even with the tiny XF35mm f/2 attached), but you could probably do this with a Sony A6000 and a pancake lens. All told, the combo of the Field Pouch and Slide LITE makes for a wonderfully light setup, and the geek in me loves that I can use these Peak Design accessories in so many different ways. I end up using the Field Pouch as an organizer in my bag most of the time, but I don’t feel like I’m under-utilizing it. It’s an organizer I already have with me, which can quickly convert it into a cross-body pouch when I want something even lighter. This isn’t something I’ll have to dig out of the closet and dust off — it has replaced my old canvas pouch, and added a lot more functionality and expandability. You can stash everyday items like phones and wallets in the pouch, too. 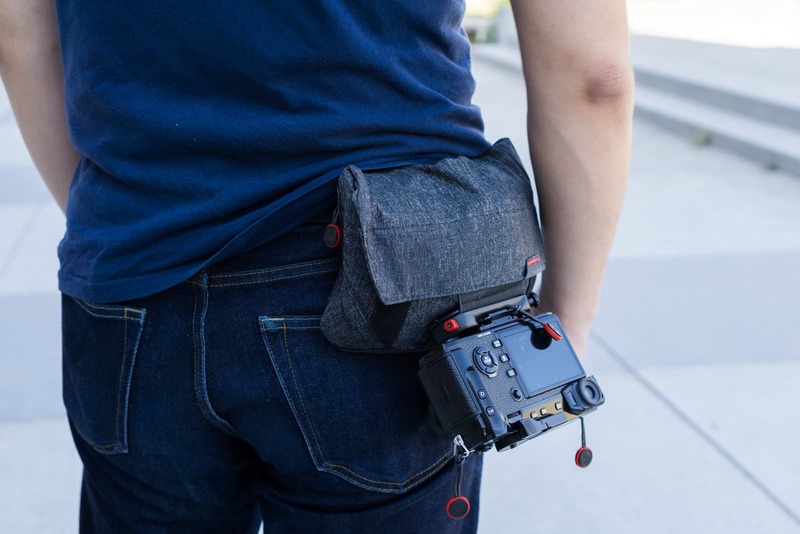 I don’t want to over-hype the $40 Field Pouch here because it is honestly just a simple weather-resistant, expandable, multi-functional micro bag that also lets you mount your camera. 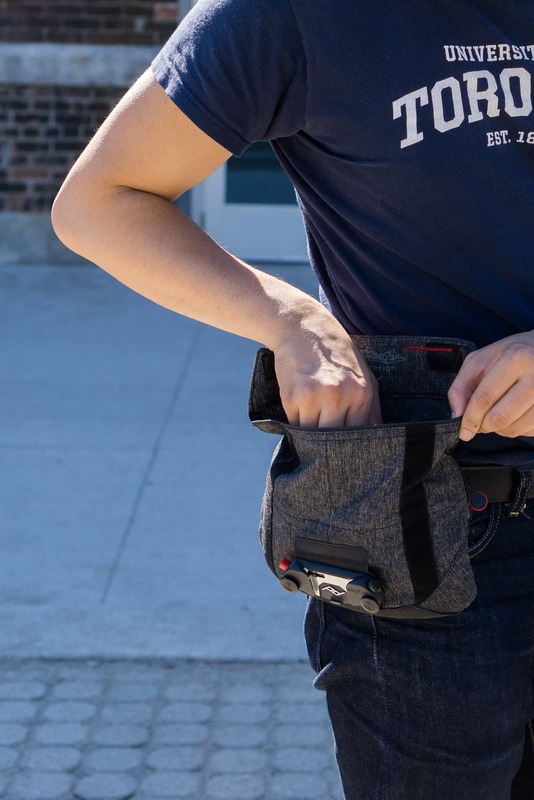 That said, this little pouch offers some incredible value, and even if you don’t take advantage of the myriad of ways it can be worn and carried, it will likely still have features that can replace some gear pouch or dopp kit you already own. It may not look as exciting as some of Peak Design’s bigger bags, but I really love this little Field Pouch.